Compact, lightweight design - ideal for compact PowerShot cameras (G-series and select SX-series) and all EOS Digital SLR! 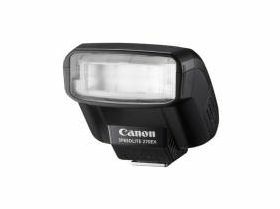 Perfect for expanding your creative options on compact cameras and entry-level EOS DSLRs, Canon's new Speedlite 270EX adds power and flexibility for enhanced flash photography anywhere. Light, compact and small enough to fit in your pocket, Speedlite 270EX features 2-step coverage for 28mm and 50mm focal lengths, plus a highly useful bounce-flash function for amazingly easy, polished results. Powered by 2 AA batteries (not included), Speedlite 270EX is easily set-up and controlled through your camera's menu system (with select models), communicates color temperature information with your camera for optimal white balance and recharges silently in less than 4 seconds. An indispensable complement to your Canon camera, Speedlite 270EX is a perfect extension of your photographic genius.